The beacon is based on an arduino nano, it drives an AD9850 module by hardware serial communication (SPI). The supply of the AD9850 is controlled by the arduino allowing to reduce energy consumpsion when the beacon is battery operated. A pulse width modulation output of the microcontroler is used to set the gain of the power amplifier made with 4 mosfets BS170 in parallel. 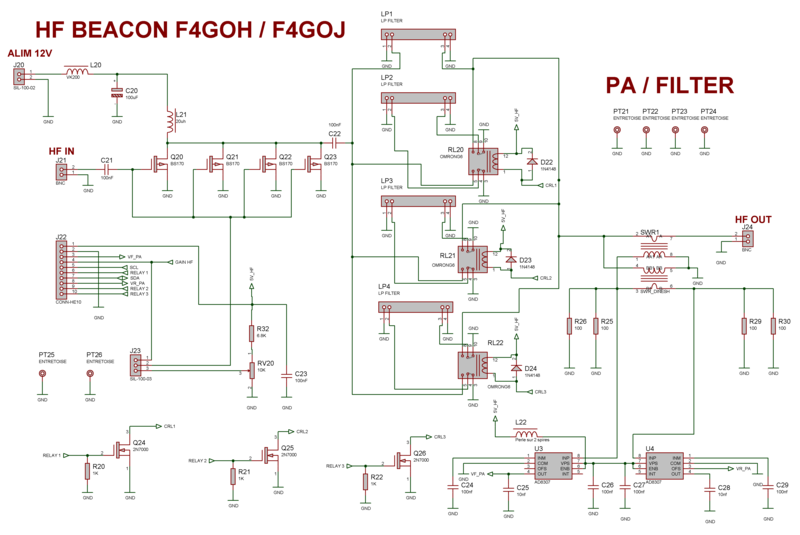 The arduino controls the switching of low pass filters relays. The I²C bus allows to control the LCD display, the real time clock and the tuning unit if it is connected. Two analog digital converters of the arduino are used to measure the direct and reflected powers needed to control the tuning unit. 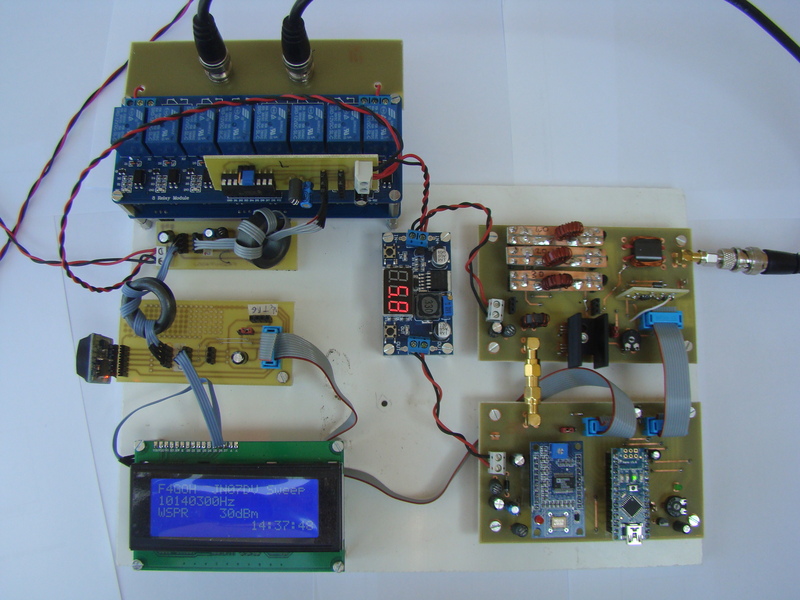 A switching power supply module based on a LM2596 is used for its high efficiency. The arduino nano as a built-in USB converter used to upload the sketch and configure the beacon with the dedicated software. The main board is essentially composed of the arduino nano and DDS AD9850 modules. There is also the DDS power switch with Q1 transistor, the LF low pass filter to average the power amplifier PWM gain command. The potentiometer is not used in the software actual version. A LM385-2.5V is essential to have the best possible precision in direct and reflected powers measures. The power amplifier is made with 4 bs170 in parallel. The gain can be set manually or by the arduino gain command. Selection is done with J32 jumper. There are 4 filters slots with 3 relay switchable. The user has to make his own 3rd or 5th order filters according to his prefered bands. The tandem coupler used to measure the direct and reflected powers is made with a binocular toroïd BN-43-202 (2×25 turns). 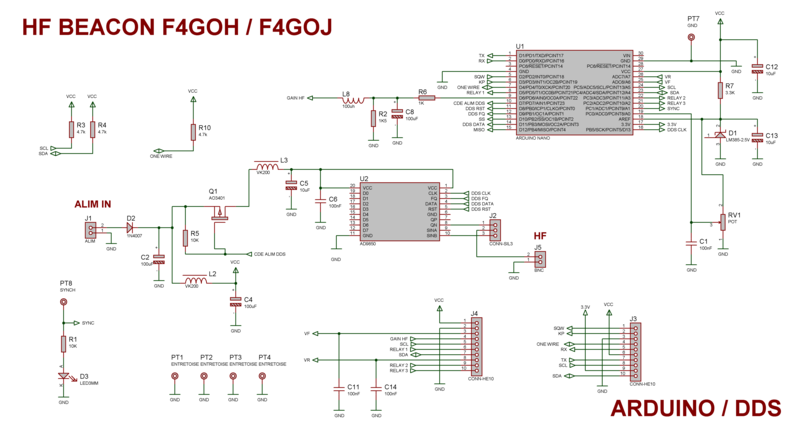 The HF transmitted powers are relatively low, so instead of using rectifier diodes, two logarithmic amplifiers AD8307 provide two variables DC voltages to the arduino analog digital converters, images of these powers. For not overloading the main card, an extension card allows to connect all the peripherals. The RTC DS3231 module is directly plugged in this card. The other I²C connectors are used to connect the LCD display and the tuning unit. 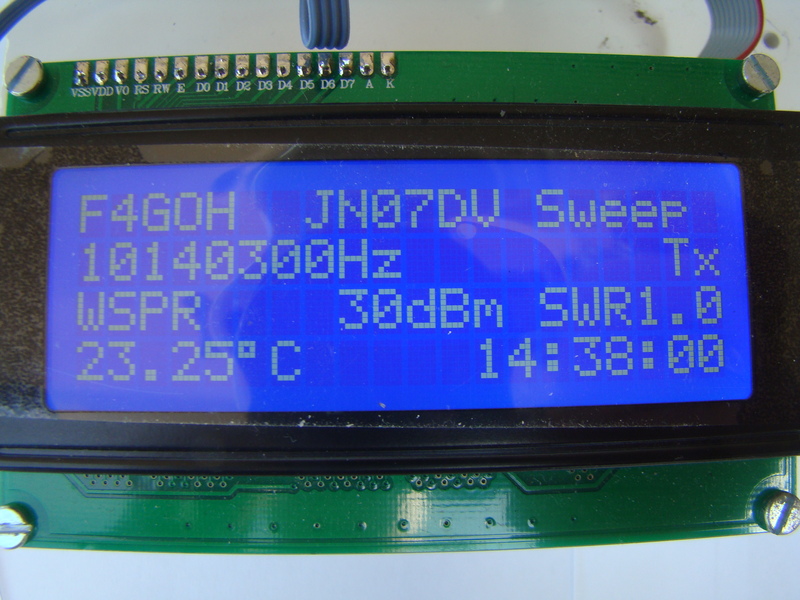 The 4×20 alphanumerical LCD display has a I²C PCF8574 backpack. This allows to free many pins on the microcontroller. Uncompress the downloaded files. This will result in a folder containing all the files for the library, that has a name that includes the branch name, usually nameofthelibrary-master. Copy the renamed folder to the Arduino sketchbook\libraries folder. Start by building the arduino main card. Check the supplies without the modules then plug the arduino nano. 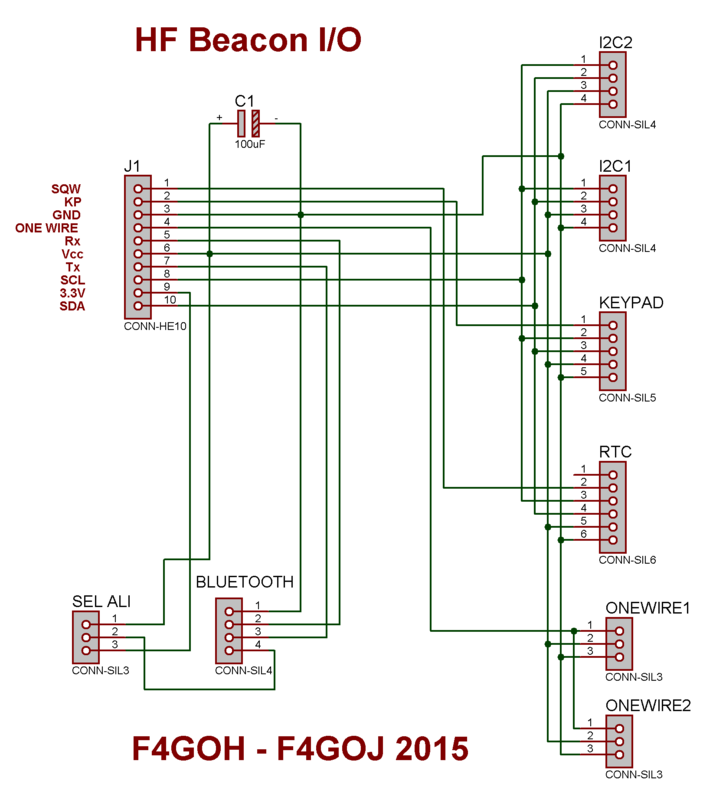 Upload sketch using Arduino 1.0.6 IDE using hf beacon v1.ino file. By default the program is in debug mode or set it as such. Now insert the AD9850 DDS module. Return to the debug menu, then « a » key to switch on the DDS. 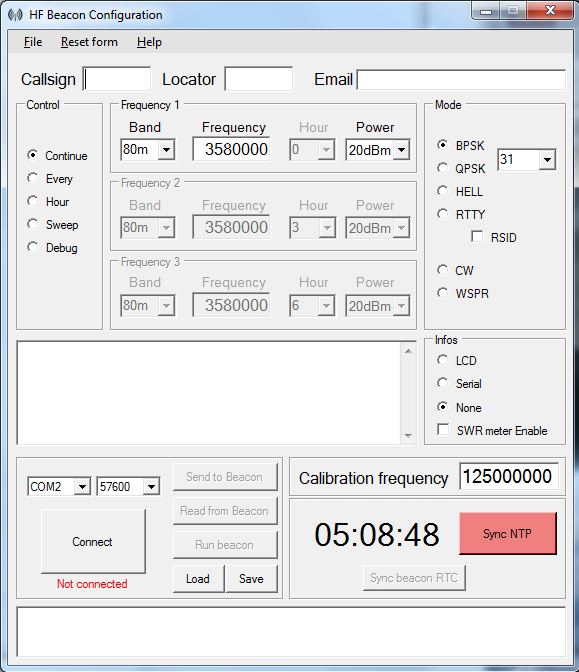 « 2 » key to select 40m band. Position the J2 jumper in position 1-2 (TTL output) and set the DDS module potentiometer to have a 7,100MHz square signal on the SMA output. Check gain control voltage C8 terminals (key « e » increment, key « d » decrement). The voltage must not exceed 3V for a max set of 255. Start with soldering the 4 BS170 transistors, relays, connectors and discrete components. Replace L21 inductor by a 1 kΩ resistor. Using the potentiometer J32 jumper in position 2-3, check the transistors drain switching. Connect the card to the Arduino board and check relays switching (w, x, c and v keys).